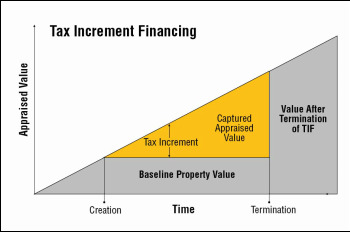 Tax Increment Financing (TIF) is an economic vehicle used by municipalities to encourage development that captures the incremental increase in ad valorem property taxes resulting from development projects. The TIF tool is used throughout the country in almost every state. TIF helps municipalities attract new jobs, business and investments that would not occur but for the TIF. The incentive can be a good alternative to a PILOT (Payment In Lieu of Taxes) because the municipality continues to receive base property tax revenue. TIF supported development typically causes surrounding property values to increase and TIF bonds will not effect a municipality’s bonding capacity or its rating. Adoption of Redevelopment Plans by local government containing a TIF component. Once the redevelopment plan is approved, the ad valorem property taxes may be divided between the municipality and the housing agency. The municipality continues to receive the “base year” taxes (i.e., the most recent valuation year prior to the plan’s approval) and all dedicated taxes, and the agency receives anything above that. The housing agency uses the increment to secure bond issuances for redevelopment projects. What does it apply to? Typically used for specific individual projects. Where does the authority come from? T.C.A. 7-53-101 eq. seq. This is the newest form of tax increment financing. This authority has only existed since 2004, when the legislature amended the statute to allow Industrial Development Boards (IDB) to utilize TIF . How does it work? IDB adopts an Economic Impact Plan encompassing an Economic Development District and containing a “project” or an Industrial Park. Increase in ad valorem property taxes used to service debt for the project. What can a TIF funds be used for? Debt service on bonds or other obligations issued to pay the cost of projects. TIF debt must be repaid in not more than 20 years. Once the debt is repaid the municipality receives both the base tax revenue and the incremental increase in property tax revenue. TIF debt represents no financial risk to the municipality or the IDB. TIF does not result in lost property revenue for the municipality. The municipality does not pay for development costs, the TIF district pays for these costs. Developer typically must arrange financing with the lender. Lenders frequently require guaranty agreements at least until the project is completed and the ad valorem property tax revenues are established. Property taxes are a first lien on the real estate.